In a post on the US PlayStation Blog, it has been announced that the ever popular co-op puzzle platforming game, Human: Fall Flat, will be getting a new level later in April 2019, along with some new customization items for players to collect. The new update is titled “Dark” and it appears to be spookier than usual. With new items like skeleton costumes, and a horror themed level, it is never too late to get into the Halloween spirit, right? The Dark Update has a total of 13 new items for players to collect and will be released as a free update on April 16th. 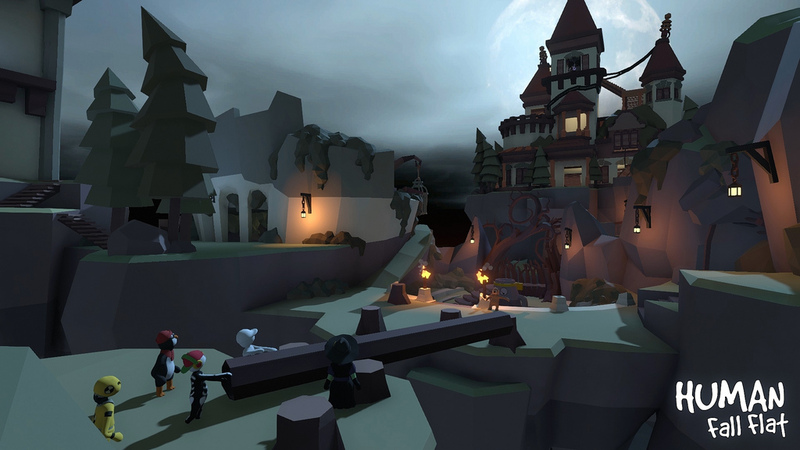 Michael Robinson, Senior Producer at Curve Digital, referenced movies such as Beetlejuice and A Nightmare Before Christmas as inspiration for this new level. He stated that the team used two existing levels, Power Plant and Aztec as framework to begin building this level. He also said that this is the game’s first night level, so they really ramped up the horror movie tropes to give it an eerie feel. Check out the new trailer for Human: Fall Flat‘s Dark Update! Developed by No Brakes Games, Human: Fall Flat is a co-op puzzle platformer that heavily relies on physics and teamwork to reach the end of the level. You must use everything in your immediate surroundings to find a way to beat the level. Whether it’s toppling an object to span the length of a gap, creating a bridge for you and friends to cross safely, or creating a make-shift catapult of sorts to launch you and your friends across that gap, there are multiple ways to beat a level in Human: Fall Flat. The only thing that limits you is your imagination, and perhaps your friends trying to throw you off of a ledge. Are you excited for this new horror-themed update? Let us know in the comments!